An infrared look by NASA's Terra satellite found powerful storms in the center of Tropical Storm Cimaron that resembled a "Picasso-like" face as they zig-zagged around the center of circulation. 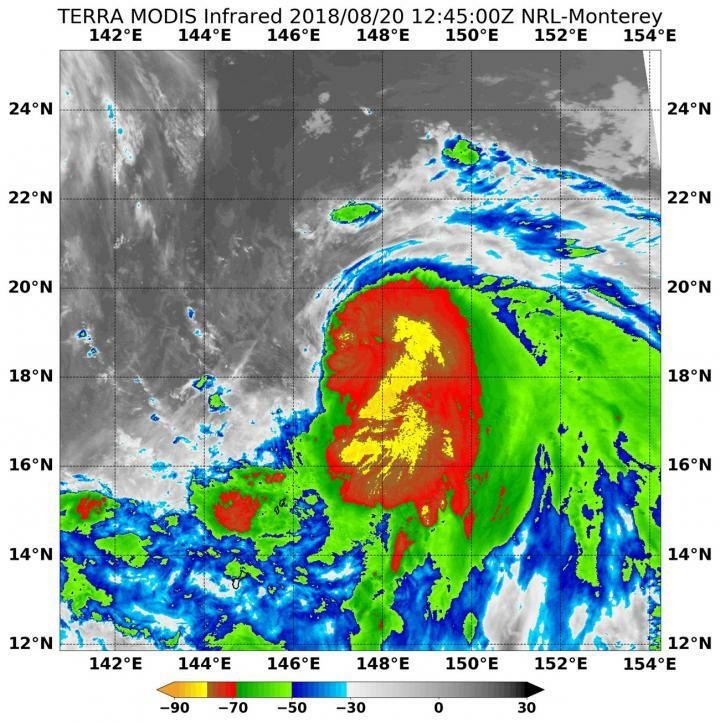 On Aug. 20 at 8:45 a.m. EDT (1245 UTC) the Moderate Resolution Imaging Spectroradiometer or MODIS instrument aboard NASA's Terra satellite analyzed Tropical Storm Cimaron's cloud top temperatures in infrared light. MODIS found cloud top temperatures of strongest thunderstorms were as cold as or colder than minus 80 degrees Fahrenheit (minus 62.2 Celsius) around the center. Cloud top temperatures that cold indicate strong storms that have the capability to create heavy rain. The Joint Typhoon Warning Center or JTWC noted that animated enhanced infrared satellite imagery showed banding features wrapping into a partially exposed low level circulation center. Tropical Storm Cimaron is forecast to track northwestward to north-northwestward along the western periphery of the sub-tropical ridge of high pressure until rounding the ridge axis in three days. JTWC said that environmental conditions will remain favorable and support steady intensification until Cimaron reaches a peak intensity on Aug. 22. Cimaron is forecast to make landfall in south central Japan on Aug. 23.